I was commenting on a post from When all is said … and I had an idea. Not necessarily an original idea, but it’s the first time it popped into my brain so I’m calling it my idea. You see, I read a lot. Not only do I read a lot but I buy a lot of books, mostly from Amazon.com. As a result I pretty much always have a stack of empty cardboard shipping boxes piled up in a corner, sometimes in my home office (mostly), sometimes in the kitchen (at the moment). My idea is that Amazon should provide a reusable shipping carton that we can swap back and forth. They could send me my monthly fix of books (aka, my regular order) in the reusable plastic carton then I could fold it down and return it empty just in time for the next month’s shipment. Just think of all the cardboard, and the trees, that would be saved. Even better, Amazon could provide the cartons printed on the inside with the “postage paid business reply” stuff needed so when returned to them empty it wouldn’t cost me a penny. But would they just up their shipping charges or the cost of books? Maybe, or maybe not. Anyway, the failing Postal Service could also benefit because they’d be getting paid for the mailing costs going both ways. Which is one more than they’re getting paid for at the moment. Amazon would save tons of money because they wouldn’t have to keep buying loads of cardboard boxes. They would have to keep buying the reusable plastic cartons, though, because, let’s face it, even plastic wears out eventually. But, not as often as cardboard! They wouldn’t have to send my books in my carton either. 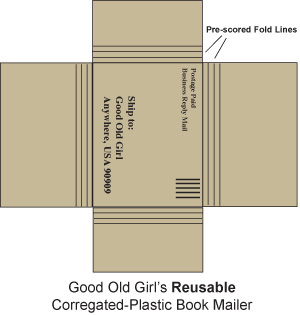 They could just send them in any old reusable plastic carton from anybody’s last book order. I mean, why would they want to have to keep up with which carton belongs to which customer? The cartons would be printed on one side with the Amazon logo and a place to slap a shipping label. The other side could have the standard business reply mailer stuff. You know, the bar code, etc. Now, if I could just figure out how to make reusable packing tape. A hearty, though belated, thanks to fellow blogger, Gail, at The Jotter’s Joint, for nominating my blog. If you’re not familiar with her blog, check it out. I know you’ll be glad you did. Nominate other blogs, at least 5 but as many as 10 if you like. Be sure to let them know they’ve been nominated. The Canary Review – A great blog about books. Nonsense to Momsense – Funny. Funny. Funny. Magic in Little Things – Touches my heart. A Minimalist’s Bookshelf – Words about words. Love it. Kristen Lamb’s Blog – Lots to be learned from this savvy blogger. It’s up there on the right. Can’t miss it. List my top 5 books of all time. Atlas Shrugged, by Ayn Rand: You either love Rand’s epic novel or you hate it and all it and it’s author ever stood for. Me? I thoroughly enjoyed the read. I first read it as an impressionable eighteen year old and thought it was the greatest book ever written. I grew up, however, and realized that, for me, it’s just an entertaining story about interesting people. Still love to read it, though. The Stand, by Steven King: This novel scared the bejeezus out of me. A truly excellent read. If you haven’t read it, then buy it, borrow it, or even snitch it, but read it. Soon. This Perfect Day, by Ira Levin: Levin delivers the goods in this book. Very, very interesting read. Try it. It’s nothing like Rosemary’s Baby. The Hobbit, by J.R.R. Tolkien: My first introduction to fantasy. Can’t wait for the movie to come out. If it’s half as good as the book, it will be excellent. The Crystal Cave, by Mary Stewart: Arthur. Merlin. A quest. What more could you want in a great book? It’s a trilogy so be sure to read the other two books as well … The Hollow Hills and The Last Enchantment. Karma – It’s a Wicked Thing! Sitting here thinking about what to blog about. I already milked my cataract surgery for all it’s worth so time to move on to something at least halfway interesting that doesn’t include body parts or involve a book review but can’t think of a thing. You sit in front of the keyboard with your fingers desperate to type but there’s absolutely nothing floating around in your pea brain that’s fit to share with the rest of the world. At times like these, you suffer for your art in a way that only the truly devoted can understand. All you want to do is tap, tap, tap on those keys but not a thing pops into your head. I would share with you the actual title of that book except that I must have given it away (maybe to Goodwill) because I sure can’t find it on any of my bookshelves and I just wasted a good five minutes searching for it. I did come across a couple of other reads, however, that you might find interesting. The first is What Is Karma? by Paul Brunton. It caught my eye as I was scanning the shelves because I’m pretty sure tonight’s writer’s block is really just payback for giving away that other book. 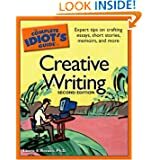 I spent another 5 minutes scanning Amazon.com for a title about writing that looked familiar but no luck. 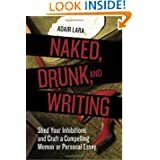 Did you know there are about a gazillion books out there that explain writing everything from books to screenplays? I have to fess up that I’ve not read either of these books. I also have to admit that I just love the titles so I might one day. I’m not sure exactly when it happened, but at some point or other, I started to really dislike shopping. I’m not talking about shopping for something specific like a ladder or a lamp for my office. I’m talking about window shopping, browsing for fun, strolling the mall to see what’s new — that sort of shopping. I can think of about a gazillion things I’d rather do with my time, including going to the post office. Shopping is tedious unless there’s something specific that I need to find. But, as with most things, there is an exception or two. Second is Internet shopping. I can spend half a day on Amazon. And, then there’s Muffys. (They have saddle shoes. Real ones. In brown or green as well as black.) Then there’s Greenleaf. I tracked them down after a vacation in Charleston where I found the best sachet — honey and orange — pure bliss for my sniffer. So, what brought all this up? I made my annual Spring pilgrimage to the local mall a couple of days ago and found a great sweater, but not in my size. Of course, the clerk called around to their other stores and found one for me. So now, I have to go pick it up tomorrow at the “big” mall about 30 miles away. I dread it. Too many people. I haven’t a clue where this specific store is in that mall. It’ll take forever. Yada, yada yada. I really like that sweater, though. Guess I’ll just have to tough it out. If you don’t hear from me within a week, send out a search party ’cause I’ve gone on a shopping spree!